Would you believe that I only own two Lamy pens? 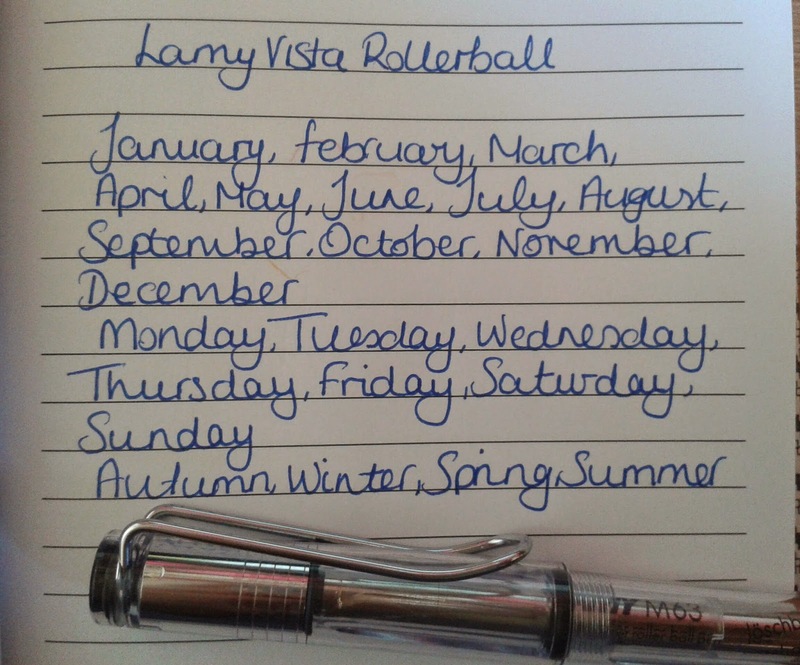 The first one is a Tipo and the second is this Lamy Vista rollerball. I was originally attracted to the transparent barrel, hanging on the peg, inards exposed as if to reassure me there would be no nasty surprises. Two things crossed my mind while I was deciding whether I should take this pen home. The first was - Great! I can see how it works without even unscrewing it. It's simple and that means less things are likely to go wrong with it. The second thing was that maybe I ought to avert my eyes. It was like being asked on a date by a really hot guy who I've had a crush on for like, forever and then realising he's naked. Nothing has been left to the imagination so now I'm not nearly as excited to get him home and try him out. But if I leave him *ahem* hanging there, I might be missing out on some hot stuff so I take him home anyway to see what he can do. THE PEN! I take the pen home, what did you think I meant? Tut Tut, this is a pen blog not Mills and Boon. So anyway, I put the naked pen in my basket and take it home. (actually that's a lie, my mum took the pen home, but I got it back a few weeks later, gift wrapped on my birthday). One delicious pizza, a bit too much cake, a weeks worth of caffeine and a full tummy later, it was time to go home and see if I was right to choose the Lamy Vista. I gave the clear plastic barrel a few hard taps, trying to get a feel for the pens strength. 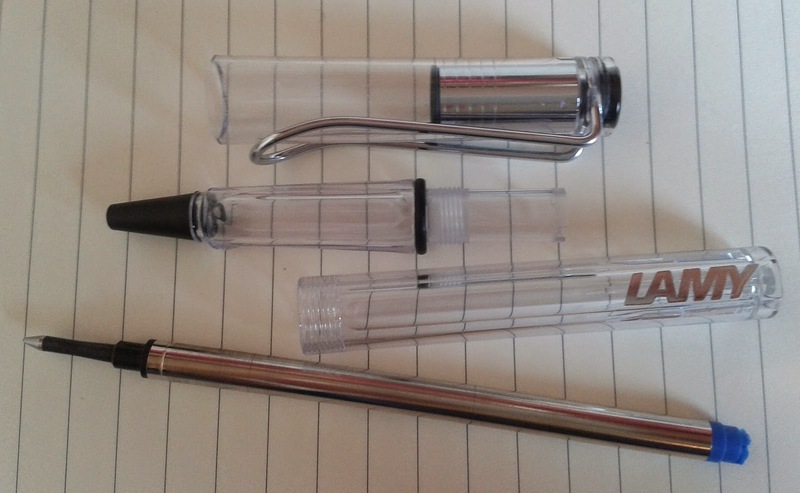 Would too much uncapping or unscrewing cause the pen to crack over time like many of the plastic pens I've used in the past? I hoped not. The plastic felt thick and strong. I felt reassured. Upon closer inspection I realised that although I could see the refill, I couldn't see the ink inside, not that I'll lose any sleep over it. It's quite a chunky looking pen but after removing the lid, wrapping my fingers round the triangular grip and feeling surprised at how light it felt, the pen didn't seem so chunky after all. As someone who spends alot of time writing, a functional grip is important to me. Slip sliding my way through a notebook is not my idea of fun. The triangular grip area on the Lamy Vista makes the lack of a textured grip OK. There's no fumbling around for a comfortable position and the subtle flick cleverly positioned at the end of the grip prevents my fingers from slipping. So here comes the important question. Does this Lamy Vista with its impressive physique know what to do with its ink? Of course it does! You only have to look at my writing sample to see that this pen can make even the most boring text look inviting. The ink flows with confidence, easily keeping up with all of the loops and curls, making sure every letter is complete and skip free. The ink is kind to my notebooks, shadowing ever so slightly but showing no signs of bleeding through the page. 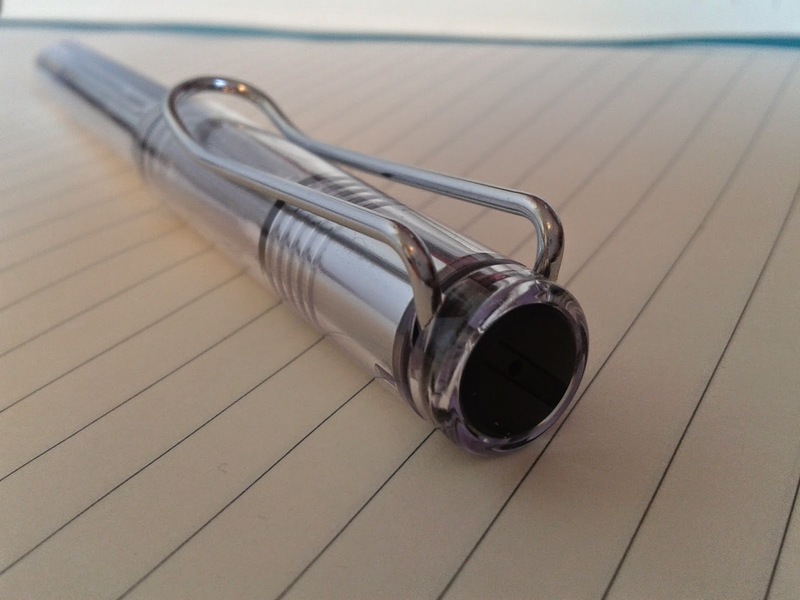 Left handers - this is a pen I think you might like. The ink dries instantly as far as I can tell. I had absolutely no problem with smudging. The only time I felt I needed to take extra caution was while writing out a birthday card. The ink looked beautiful on the glossy surface but took quite a while to dry so I had to resort to wafting the card in the air to speed things up a bit. OK, don't laugh, but so long as I have this Lamy Vista in my hand I think I could copy pages from the phone book all day and actually enjoy it. It makes writing so easy. It feels silky smooth on paper and even when applying the tiniest amount of pressure it still produces a flawless finish. 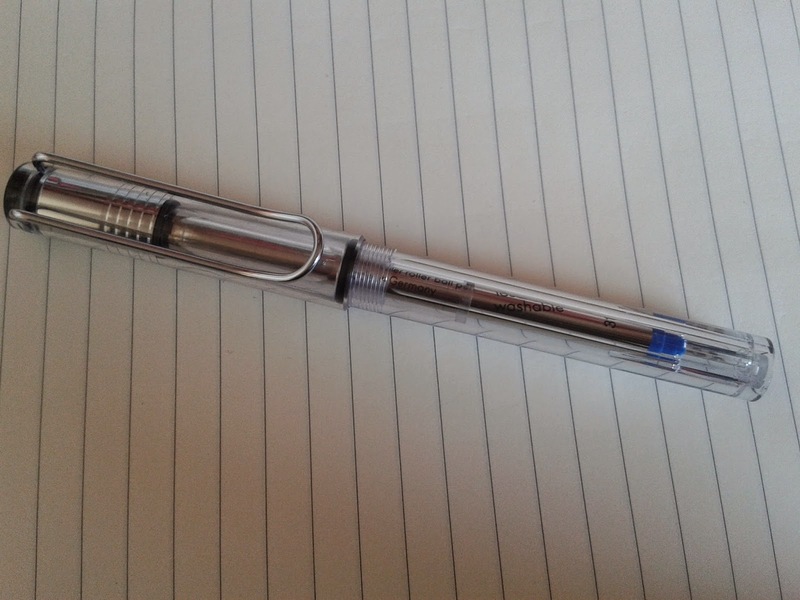 The only way refilling this pen could be any easier would be if it refilled itself. 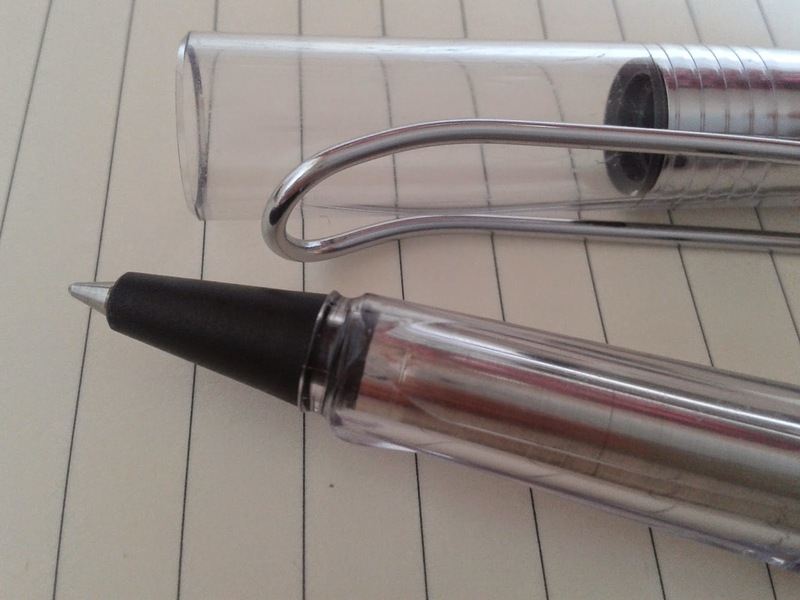 Unscrew the pen, slide the old refill out, slide the new one in, screw back together. No faffy springs to lose, no messing about. Job done. 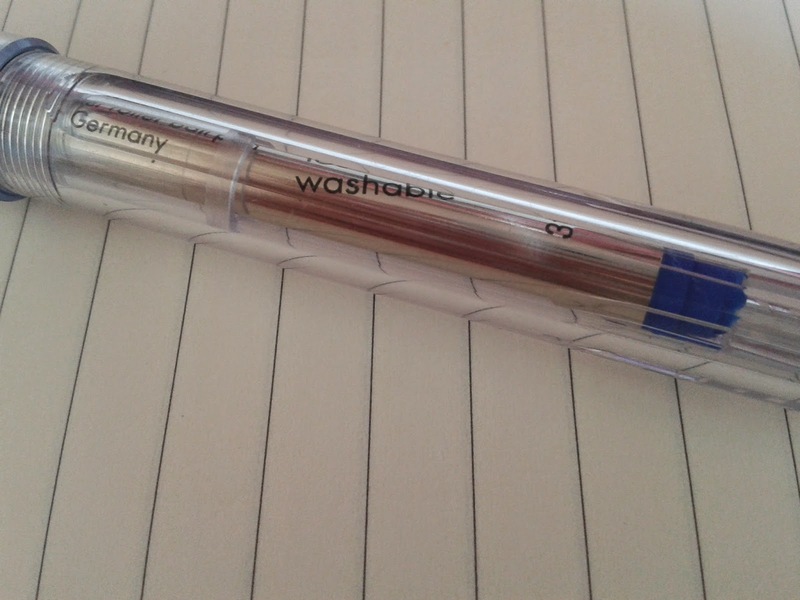 You don't even need to open the pen up to see that it takes a Lamy M63 rollerball refill. Jiminy Cricket? Is that you? The lid posts nicely on the end although I'm not a poster. I don't like the extra weight dragging me down, although to be fair the lid is light so it doesn't make a huge difference, but I like what I like so I'll be holding the lid in my spare hand like I always do. And anyway, I have to keep my spare hand busy otherwise it starts reaching out for desk snacks. Not good. The lid is secure. I have no worries about it coming loose while clipped to my lanyard. The clip certainly catches the eye, it's big enough. It's reliable, safely clipping to most things thanks to it's flexibility and that will do for me. It looks a bit like a Cricket, don't you think? I have much love for my Lamy Tipo but it has to be said, the Vista makes it look pretty crappy in comparison.